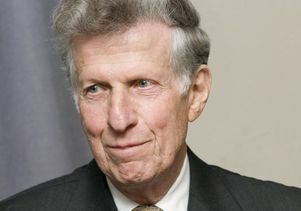 Stanley Wolpert, UCLA professor emeritus of history and prolific author of books about South Asia, has died. He was 91. Wolpert, who died Feb. 19, is revered for his contributions to literature and the history of South Asia. He published more than a dozen scholarly books including biographies of Mahatma Gandhi and Jawaharlal Nehru of India as well as biographies of Mohammad Ali Jinnah and Zulfikar Ali Bhutto of Pakistan. His “New History of India” has appeared in eight editions, and his more general cultural introduction, “India,” is in its fourth edition. Wolpert’s teaching career at UCLA spanned six decades including time served as chair of the history department and in a vice chancellorship. Campus colleagues, students and the literary world remember him as the epitome of grace and intellect. The publication celebrated Wolpert’s attention to detail, commitment to dispelling stereotypes and his ability to link present and past as well as personal and professional in the subjects of his authorship. His works “will remain a guiding light to every person and student who wishes to know the complex and convoluted history of Indo-Pakistan and how we emerged out of the clutches of hatred, colonialism and treachery,” according to the publication. During the Nixon administration, the New York Times published a list compiled by the United States Information Agency of 80 people who should not be invited anywhere to speak on behalf of the United States and Wolpert was proud to have made the list, which also included Walter Cronkite and Arthur Schlesinger, as to him it symbolized his commitment to speaking truth to power. Wolpert was also deeply committed to education innovation. He was a recipient of the University Distinguished Service Award. While serving as a vice chancellor he founded the initiative that eventually became the Honors program in the UCLA College of Letters and Science. Of his four novels, the most notable remains “Nine Hours to Rama,” published in 1961. The fictionalized accounting of the day Nathuram Godse assassinated Gandhi was made into an American film directed by Mark Robson the following year. Both book and film were banned in India and remain so to this day. He is survived by his wife of 65 years, Dorothy and his sons Daniel and Adam, his daughters-in-law Debra and Katy, as well as three grandchildren, Sam, Max and Sabine.